The statement that Krishna did not save her, may appear as untrue. When we read the following facts, we may find there are other stories regarding how Draupadi was saved on that shameful day, when Yushishthira lost everything. All gurus and sages remained silent while Dushashana was trying to disrobe Draupadi. Duryodhana, Dushashana and even Karna did not hesitate in this wrong doing. This presents a bigger problem and this is prevalent in today as well. Everyone on that day had a reason not to interfere on that shameful day. It was good that someone was able to retrieve or save Draupadi’s modesty. But if we look at today’s scenario, we will find Bhsihma’s and Drona’s who are blind to all the evils, but we could not find “the saviour” who can do something about present day’s situation. So, as we know that Shri Krishna, whom Draupadi summoned to save her from disrespect. But, in Vyasa’s mahabharat, the saviour from cheer haran is someone else. This is attributed to Dharma and it is symbolic. This means it can be the god Dharma, Krishna as the Lord of Dharma, or even Vidura or Yudhishthira. So it is not clearly stated that who was indeed the saviour of Draupadi. in the famous TV serial named Mahabharat, Draupadi summons Keshav (Krishna) in her hour of peril(cheer haran) and Shri Krishna saves her. There is a story related to this. Once Shri Krishna cut his finger with sudarshan chakra. 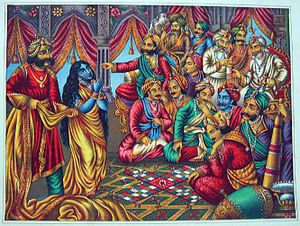 Draupadi tore her veil to put it around Krishna’s bleeding finger. Lord Krishna was very touched by the gratitude done by Draupadi. He promised her to repay the debt and to protect her from all evils. He protected Draupadi when Draupadi prayed when her sari was being pulled after Duryodhan won her in the dice game. There is also an interesting story of Durvasa saving Draupadi from cheer haran which is narrated below. Shiva Purana attributes her miraculous rescue to a boon granted by Durvasa. The story goes that the sage’s loincloth was once carried away by the Ganges’s currents. Draupadi quickly tore a piece of her garment to cover him. The sage was pleased with her. He granted Draupadi a boon which caused an unending stream of cloth to cover her when Dushasana was trying to strip her in Hastinapura’s royal dice-hall. Never heard of the Durvasa story about saving Draupadi, very interesting indeed. Krishna saved her from cheer haran….when krishna killed shiahupal by sudarshan chakra …he got injured n so Draupadi tied piece of cloth from her dress…it is said that there were 999 strimgs in piece of cloth …krishna promised her that i will pay back your ‘Hrin’ by the time coming….. I tought that lord Krishna accidentally cut his hand while flying kites in indraprastha, and draupadi cut a part of her dress and bandages Krishna’s hand. So Krishna saved draupadi that day. The story about flying kites is not supported by any scripture. It is more appealing that Krishna injured his finger while killing shishupal and Draupadi tore her sari to bandage his finger.